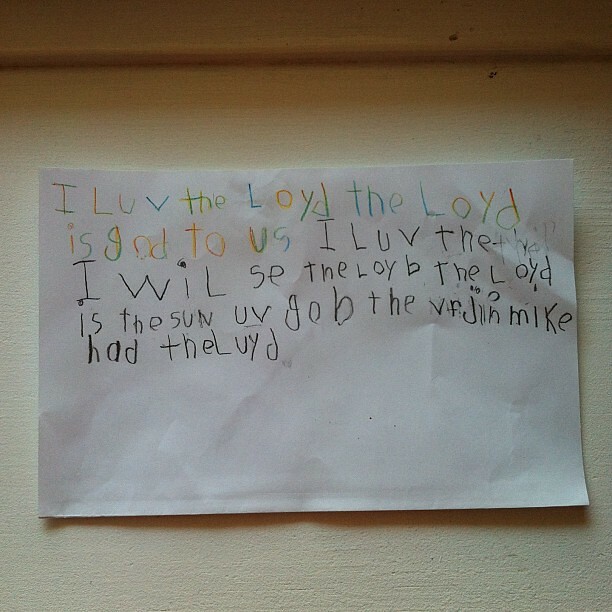 I love the Lord. The Lord is good. I love the Lord. I will see the Lord. The Lord is the Son of God. The Virgin Mary had the Lord. Father John was shoveling a little path from the church to the coffee hour room yesterday afternoon after a little snow fell in our area. When he came inside, Sugar Plum presented him with this little paragraph that she wrote all by herself! Writing and reading have been a struggle for our little girl, and I am so happy that it is all finally clicking for her! I Love This! What a great job she did! It is so special when they start to put together their own thoughts in their own words. What a treasure! If it is a struggle, just let it go until she is ready. Read the book Better Late than Early by Raymond and Dorothy Moore. Wonderful! I've had reluctant readers turn into book hounds and reluctant writers turn into... writers and artists! All in good time--sometimes the struggle makes it all the sweeter later on. That is beautiful! She did such a nice job! !